Papillion & Louisville and the surrounding areas. I work on a reward basis...That means you pay me what you can afford and what my service is worth to you for me to find your lost item. Permission must be obtained on private property, I have park permits retired and can hunt almost anytime. I have been a detectorist since 1983 I hunt land and water but I do not scuba dive...I have always tried to return every class ring I found, I have found many rings for people including one for a lady who's daughter sadly had been killed in a car accident the year prior, the look on her face when i recovered her daughters ring was priceless. 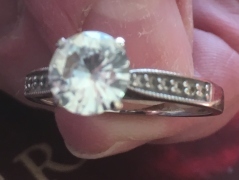 Found a Wedding band for a Gentleman who wanted to show his wife that his Ring couldn’t come off cause it was tight and he said see honey its! oops. We are very thankful that we found Ted Erickson through “theringfinders” website. 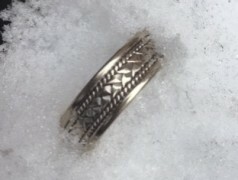 In less than 5 minutes he found the ring (in a chunk of ice). We had spent hours searching for with no success. Ted, I can’t believe what a blessing you were to me today. I’ve literally been losing sleep over not being able to find my ring. You came out on Valentine’s Day and foundry ring in such a short period of time I almost couldn’t believe it. Thank you so much for finding my most prized possession. Ted was so kind and helpful. I would recommend him to anyone!!! !